The New Brunswick Massotherapy Association – l’Association de massothérapie du Nouveau Brunswick (NBMA-AMNB) provides education to the public and support and professional development for its members. In cooperation with other health-care professions the NBMA-AMNB contributes meaningfully to the wellness of the public. 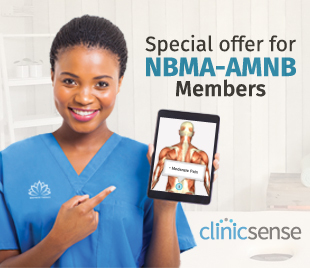 Members of the NBMA-AMNB have access and encouragement to participate in professional education and management training for the development of the massage therapy profession. The NBMA-AMNB provides the highest level of competency and professionalism in massage therapy. Members of the NBMA-AMNB have a favourable impact on the New Brunswick economy by promoting enhanced health of New Brunswickers through massage therapy. the professionalism of our members which contributes to the benefit of those receiving massage therapy. the promotion and encouragement of ongoing professional development as an essential component of membership. the diversity of members’ skills and knowledge as essential to mutual support in the successful delivery of appropriate massage therapies.